Video abstract presented by Roi Anteby. Purpose: To evaluate visual and surgical outcomes in very elderly patients (above 85 years of age) undergoing pars plana vitrectomy (PPV). Patients and methods: A single-center, retrospective study was carried out on the medical records of 82 patients aged 85 years and older who had undergone PPV from 2006 to 2013. Patients ranged in age from 86 to 99 years, with a mean age of 88.9 years (±2.88). Visual results and intraoperative and postoperative complications were the main outcome measures. Visual improvement/worsening was defined as at least ±0.1 logMAR change. Results: Mean follow-up was 7.25 months (±5.35), with a range of 1–28 months. General anesthesia was used in 63% of the operations. The most common indication was retinal detachment (27%). The ocular condition necessitating PPV was secondary to trauma (most commonly after a fall) in 10 eyes (12%). Mean visual acuity (VA) improved from 1/58 preoperatively to 1/29 at the final evaluation (p=0.014). Mean improvement in VA in eyes of patients with the comorbidity of age-related macular degeneration (n=34) was 41% lower compared to eyes of patients without the disease (n=48, p=0.013). In the subgroup of patients operated on for retinal detachment, 45.4% did not reach primary anatomic success and 45.4% needed additional retina-affecting surgery. One or more major ocular complications were reported in 24 eyes (29%), while 19 eyes (23%) had minor ocular complications. Conclusion: Improved VA was documented in more than half of the older adults aged 85–99 undergoing vitrectomy. Despite the rate of complications in the very elderly, the possibility of optimizing visual function may positively affect quality of life in this subgroup. This study was undertaken to fill this gap in our knowledge about the feasibility of PPV for various conditions in this unique population of patients 85 years and older. The protocol was approved by Tel Aviv Sourasky Medical Center Institutional Review Board. For this type of study, formal consent was not required by the Institutional Review Board. Waiver was provided because the research involves no more than minimal risk to the subjects and alteration will not adversely affect the rights and welfare of the subjects. All procedures performed in the study were in accordance with the ethical standards of the institutional research committee and with the 1964 Helsinki Declaration and its later amendments or comparable ethical standards. Patient confidentiality was preserved using de-identification of medical records. ORCID ID: 0000-0003-0567-0655. Registration site: ClinicalTrials.gov. Clinical Trials registration reference number: 0542-15-TLV. Medical records of all patients aged 85 years and older who underwent PPV from January 2006 to December 2013 at the Ophthalmology Department of one medical center were reviewed. Those who had had at least 1 month of follow-up were entered into the study. Data recorded included demographic characteristics (gender and age), preoperative visual parameters, ocular comorbidities, indication for surgery, surgical parameters (technique, time, and intraoperative complications), and final surgical and visual results, including the need for additional surgeries or postoperative treatments for complications. Of the 120 PPV procedures performed in this age group, 18 were excluded because of insufficient follow-up (due to non-related morbidity, missing data, and follow-up in other ophthalmology clinics). Nineteen procedures were reoperations on the same eyes during the study period and, thus, were analyzed as a failure to reach anatomic success or as a complication of the initial surgery. The remaining 83 PPV procedures were performed using a 20 G (2006–2008) or a 23 G (2008–2013) trocar system, and an Accurus vitrectome® (2006–2008; Alcon, Fort Worth, TX, USA) or Constallation® (2008–2013, Alcon). All operations were performed by the same surgeon (A Barak). All visual acuity (VA) values were converted from Snellen VA ratios to logMAR scale. In accordance with Holladay and the University of Freiburg study group results,17 no light perception was set at 0.00125/2.9 (decimal/logMAR), light perception at 0.0025/2.6, hand movements at 0.005/2.3, and counting fingers at 0.014/1.85. Visual improvement/worsening was defined as at least ±0.1 logMAR change. Data were analyzed with the statistical program Stata (Version 13.1; StataCorp, College Station, TX, USA). A p-value of 0.05 was considered statistically significant. Paired two samples for means t-test was used to compare means, and regression analysis was used to trace influence of explanatory variables on the dependent variable (improvement in VA). The PPV procedures were performed in 83 eyes of 82 patients: 45 women (55%) and 37 (45%) men, mean age 88.9 years (±2.88, range 86–99 years), 31 right eyes and 52 left eyes. In 26 procedures (31.7%), the patients were 90 years and older. Mean follow-up was 7.25 months (±5.35, range 1–28 months). 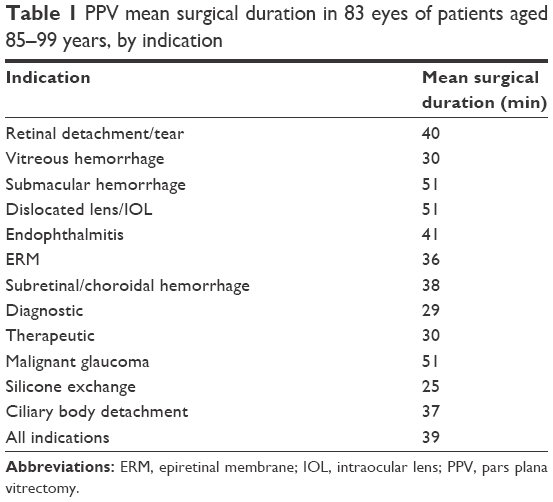 The indications for PPV surgery in our study were RD and tear (26.5%), VH (12%), submacular hemorrhage (SMH; 10.8%), dislocated lens (9.6%), endophthalmitis (9.6%), ERM peeling (8.4%), choroidal hemorrhage (7.2%), therapeutic vascular radiation (4.8%), malignant glaucoma (2.4%), silicone exchange or removal (2.4%) and ciliary body detachment (1.2%). Out of eight eyes with endophthalmitis, five were exogenous secondary to ocular procedures (intraocular injections and cataract surgery). The rest suffered from endophthalmitis without any recent intraocular procedures or trauma. These eyes might have suffered endogenous endophthalmitis, yet we cannot determine the route of infection with certainty because medical records did not state if ocular and peripheral blood cultures were taken. The ocular condition necessitating PPV was secondary to trauma (most commonly after a fall) in 10 eyes (12%) and secondary to complications of other ocular procedures (most commonly after injections of anti-vascular endothelial growth factor for age-related macular degeneration [AMD]) in 7 eyes (8%). The most common associated ocular condition in the 83 eyes was AMD (34 eyes [42%]), mostly of neovascular type (28/34). The second most common associated ocular condition was glaucoma (12 eyes [14%]). Only four eyes (5%) had no ocular comorbidity (excluding cataract) and no past ocular surgical procedures. Other comorbidities included: cystoid macular edema (3), diabetic retinopathy (2), chronic uveitis (2), optic atrophy (2), carotid cavernous fistula (1), corneal ulcer (1), vitreomacular traction (1), corneo-scleral perforation (1), synechia (1), central retinal vein occlusion (1), microaneurysm (1), elevated intraocular pressure (IOP; 1) and corneal implant (1). Of the 83 procedures performed, 52 (63%) were done under general anesthesia and 31 (33%) with local anesthesia. In 16 (19%) procedures, phacoemulsification was conducted as part of the PPV procedure due to pre-existing cataract. The average surgery duration for each indication is presented in Table 1. Abbreviations: ERM, epiretinal membrane; IOL, intraocular lens; PPV, pars plana vitrectomy. Mean preoperative VA was 1/58 (1.765 logMAR, range 2.9–0.15) and mean final VA was 1/29 (1.458 logMAR, range 2.9–0.1; p=0.014). Mean change in VA was 0.31 logMAR. Comparison of the preoperative and final examination results yielded the following: 43 (52%) of the eyes improved in VA, 22 eyes (26%) worsened, and 18 (22%) eyes did not achieve a significant change in VA. Mean improvement in VA was 0.84 logMAR, and mean decline in VA was 0.46 logMAR. The changes in VA according to the indications for PPV surgery are shown in Table 2. Note: Δ, change in mean VA before surgery and at final evaluation. Abbreviations: HM, hand movements; IOL, intraocular lens; LP, light perception; NLP, no light perception; VA, visual acuity. In order to isolate the factors that might influence the VA results, we analyzed the differences in mean changes in VA according to gender, type of anesthesia, and comorbidity of AMD. Statistical significance was only found in the regression analysis of patients with AMD. The mean preoperative VA in 49 eyes of patients without AMD (1.779 logMAR, ±0.76) was similar to the mean preoperative VA in 34 eyes of patients with the disease (1.744 logMAR, ±0.67). As illustrated in Figure 1, mean improvement in VA at final evaluation in patients with AMD was 41% lower compared to patients without the disease (p=0.013). 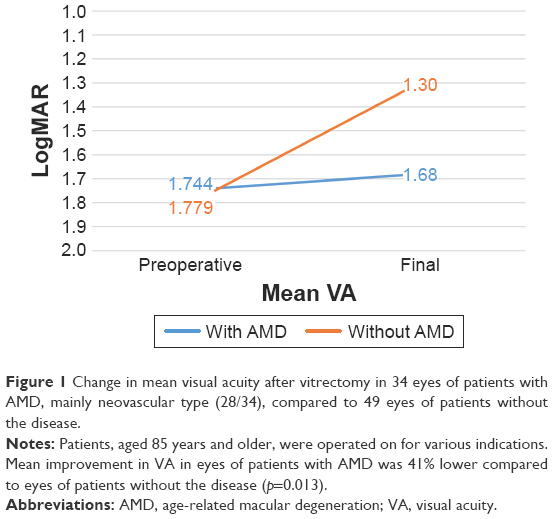 Thus, AMD is a negative prognostic factor for improvement in VA when considering vitrectomy for all indications in patients above the age of 85 years. Figure 1 Change in mean visual acuity after vitrectomy in 34 eyes of patients with AMD, mainly neovascular type (28/34), compared to 49 eyes of patients without the disease. Notes: Patients, aged 85 years and older, were operated on for various indications. Mean improvement in VA in eyes of patients with AMD was 41% lower compared to eyes of patients without the disease (p=0.013). Abbreviations: AMD, age-related macular degeneration; VA, visual acuity. Silicone oil was injected in 11 eyes for internal retinal tamponade. Additional surgery for silicone removal was conducted in four of the eyes after an average of 6 months (7 days–11 months). In the remaining eyes, silicone was not removed during follow-up. Gas tamponade was used in 11 eyes (C3F8 16%), and perfluorocarbon was used in two eyes. The only intraoperative complication in the 83 operations was massive iris hemorrhage in an 89-year-old patient undergoing PPV for intraocular lens dislocation and ERM peeling; it was successfully treated during surgery. 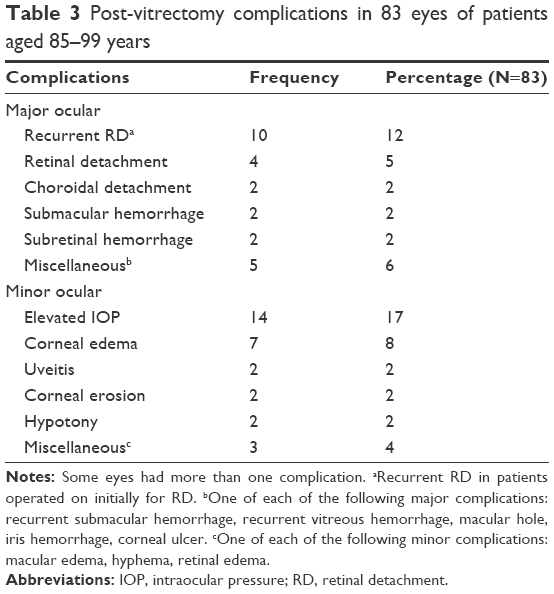 Postoperative complications, summarized in Table 3, were recorded in 43 eyes (52%; some eyes had more than one complication). Major ocular complications included RD, choroidal detachment, SMH, subretinal hemorrhage, macular hole, iris hemorrhage, and corneal ulcer. Twenty-four eyes (29%) had major complications during follow-up, 15 (18%) of which required additional surgery. Nineteen eyes (23%) had only minor complications, mostly transient elevated IOP, and/or transient corneal edema, which were treated without sequela. Notes: Some eyes had more than one complication. aRecurrent RD in patients operated on initially for RD. bOne of each of the following major complications: recurrent submacular hemorrhage, recurrent vitreous hemorrhage, macular hole, iris hemorrhage, corneal ulcer. cOne of each of the following minor complications: macular edema, hyphema, retinal edema. Abbreviations: IOP, intraocular pressure; RD, retinal detachment. Three systemic complications were reported during the study period: transient ischemic attack 5 days after surgery for RD; intraoperative pulmonary edema during an additional PPV conducted at follow-up in one patient initially operated on for RD; and massive cerebrovascular accident 5 months after vitrectomy for radiation of choroidal neovascularization. The population of very elderly patients, 85 years and older, is steadily increasing in size in Western society,4 raising concerns about the efficacy and safety of surgical interventions in view of the comorbidities and low resilience of these patients. The results of our study indicate that PPV in this population is indeed effective, but requires awareness of a number of factors: the possible postoperative complications, comorbidities, the pros and cons of general and local anesthesia, and the indication for the procedure. VA improved in more than half of our very elderly patients following vitrectomy, evidenced by a mean preoperative VA of 1/58 and a final mean VA of 1/29 (p=0.014). Also, 52% of the eyes improved at least 0.1 logMAR (equivalent to 5 ETDRS letters) by vitrectomy, compared to 26% that exhibited a decrease in VA and 22% in which the vision remained unchanged. Indications for PPV in the elderly are similar to those in the younger population.1 The higher extent of SMH as an indication for PPV in this age group is not surprising since it is more frequent in older adults, especially in patients with neovascular AMD. In our series, the most common cause of underlying vitreoretinal disease was RD, which occurred in 22 (26.5%) of the 83 eyes. In this group of patients, the improvement of vision was substantial: 1/92 (1.962 logMAR) preoperatively to a mean final VA of 1/17 (1.232 logMAR; p=0.003). Ten (45.4%) of these RD patients did not reach primary anatomic success, and 10 (45.4%) needed additional retina-affecting surgery. The relatively high rate of reoperations in this subgroup gains meaning from the report of Heimann et al on patients of various ages in a prospective randomized multicenter clinical trial. In their study of pseudophakic patients with medium complexity RD undergoing PPV, 20.4% developed re-detachments and 28% were in need of secondary retina-affecting surgery.15 Patients with RD reviewed in our series were older (average age of 88) and had a high rate of ocular comorbidities (41%, excluding cataract). In addition, 23% of the eyes had prior PPV, 41% had large RD involving the macula (macula off), 23% had complicated RD with proliferative vitreoretinopathy or large tear, and 27% were RD secondary to cataract surgery or ocular trauma. These factors may partly explain the higher rates of re-detachment and need for further surgery in our study compared to previous studies. The number of patients with RD reviewed in this study is small (22); therefore, larger cohorts are needed to reach a more validated conclusion. In our series of very elderly patients, there was only one intraoperative complication (iris hemorrhage). Most importantly, none of the 83 operated eyes developed endophthalmitis following PPV. Postoperative complication rate in our 83 eyes was high (52%). One or more major ocular complications were reported in 24 eyes (29%), while 19 eyes (23%) had only minor ocular complications. The most common minor complication was elevated IOP (17%), followed by corneal edema (8%). These complications were asymptomatic and treated without sequela. It should be emphasized that when dealing with older adults, even minor ocular complications such as elevated IOP and corneal edema might impose a significant impact on the level of activity in daily life and possibly put these patients at a higher risk of fall and injury. The most frequent major complication was re-detachments in the subgroup of patients operated on for RD (10/22). Other major complications appeared in lower frequencies (2%–6% each). A study of adverse events after PPV surgery, relying on a national representative sample of Medicare beneficiaries (mean ages 76.4–77.3 years), found that patients operated on in the USA during 2004–2005 had a 1-year complication rate of ~25% (4.9% severe, 20% less severe). Compared to earlier cohorts (from 1994 and 2000), Stein et al found an increase in rates of less-severe complications. They hypothesized that this tendency is partly a result of improvements in imaging technology and quality, advancing the ability to detect certain retinal conditions over time.19 This hypothesis also serves to explain the higher minor complication rates in our current study. Due to the factors described above, we can assume that the higher rates of complications in this series do not reflect the real risk of complication attributed only to PPV in the very elderly. Nevertheless, a possible explanation for the increased complication rates in adults above the age of 85 years compared to those published in cohorts of younger patients is the systemic and ocular degenerative changes common in the very elderly. It has been well established that aging changes occur in all the structures of the eye, causing effects that could place this subgroup at higher risk of complications. The need to modify treatment for the very elderly is underscored by the high number (63%) of PPV surgeries in our review that were conducted under general anesthesia. Even the operations conducted with local anesthesia were done under monitored anesthetic care. In contrast, Muto et al used local anesthesia in all nine surgeries of patients over 90 years of age.12 However, they claimed that maintaining a specific body position on the operating table was very painful for their patients. It should be noted that their surgeries lasted for a mean of 109 min compared to the mean of 39 min in our study. The major limitation of our study is the lack of a control group. In addition, there may have been a possible selection bias, since patients with indications for PPV who were initially too frail for surgery were not included in our review. Despite these limitations, the study is relevant since it is, to the best of our knowledge, the largest published series describing patients aged 85 and older who have undergone PPV. Elderly patients are becoming an increasing and substantial part of the patient load on the retinal surgeon, many of whom believe old age imposes a barrier to retinal surgery in various ocular conditions and question whether surgery can significantly improve VA. The strength of this study is its representation of a realistic scenario of elderly with a need for PPV and its outcome. Our study included a variety of clinical indications, applying only minor exclusion criteria. We emphasized the VA at last follow-up and all minor complications, even those that were resolved without treatment and sequela, acknowledging their grave influence on the very elderly. Keeping the limitations in mind, we suggest that this study is a step toward filling the gap in our knowledge about PPV in the very old. Our study suggests that vitrectomy is effective in improving visual function in the very elderly population. However, further research is still needed to evaluate factors guaranteeing both safety and efficacy of the procedure, including determining the predictors of operative complications; the connection between the indication for PPV and its success, and between comorbidities and success; and whether modifications of the traditional approach, such as general rather than local anesthesia, can bring better results. This work was performed in partial fulfillment of the MD thesis requirements of the Sackler Faculty of Medicine, Tel Aviv University. Chandra A, Xing W, Kadhim MR, Williamson TH. Suprachoroidal hemorrhage in pars plana vitrectomy risk factors and outcomes over 10 years. Ophthalmology. 2013;121(1):311–317. Stein JD, Zacks DN, Grossman D, Grabe H, Johnson MW, Sloan FA. Adverse events after pars plana vitrectomy among Medicare beneficiaries. Arch Ophthalmol. 2009;127(12):1656–1663. Raczyńska D, Glasner L, Serkies-Minuth E, Wujtewicz MA, Mitrosz K. Eye surgery in the elderly. Clin Interv Aging. 2016;11:407–417. Christensen K, Doblhammer G, Rau R, Vaupel JW. Ageing populations: the challenges ahead. Lancet. 2009;374(9696):1196–1208. Wubben TJ, Talwar N, Blachley TS, et al. Rates of vitrectomy among enrollees in a United States Managed Care Network, 2001–2012. Ophthalmology. 2016;123(3):590–598. Huang Y, Huang W, Ng DSC, Duan A. Risk factors for development of macular hole retinal detachment after pars plana vitrectomy for pathologic myopic foveoschisis. Retina. 2016;37(6):1049–1054. Dell’Omo R, Barca F, Tan HS, Bijl HM, Oberstein SY, Mura M. Pars plana vitrectomy for the repair of primary, inferior rhegmatogenous retinal detachment associated to inferior breaks. A comparison of a 25-gauge versus a 20-gauge system. Graefes Arch Clin Exp Ophthalmol. 2013;251(2):485–490. Mohamed YH, Ono K, Kinoshita H, et al. Success rates of vitrectomy in treatment of rhegmatogenous retinal detachment. J Ophthalmol. 2016;2016:2193518. Song SJ, Kuriyan AE, Smiddy WE. Results and prognostic factors for visual improvement after pars plana vitrectomy for idiopathic epiretinal membrane. Retina. 2015;35(5):866–872. Lim LS, Tsai A, Wong D, et al. Prognostic factor analysis of vitrectomy for retinal detachment associated with myopic macular holes. Ophthalmology. 2014;121(1):305–310. Abunajma MA, Al-Dhibi H, Abboud EB, et al. The outcomes and prognostic factors of vitrectomy in chronic diabetic traction macular detachment. Clin Ophthalmol. 2016;10:1653–1661. Muto T, Ide T, Chikuda M, Machida S. Vitrectomy in patients over 90 years of age. Clin Ophthalmol. 2016;10:239–242. Ma Y, Ying X, Zou H, et al. Rhegmatogenous retinal detachment surgery in elderly people over 70 years old: visual acuity, quality of life, and cost-utility values. PLoS One. 2014;9(10):E110256. Moisseiev E, Davidovitch Z, Kinori M, Loewenstein A, Moisseiev J, Barak A. Vitrectomy for idiopathic epiretinal membrane in elderly patients: surgical outcomes and visual prognosis. Curr Eye Res. 2012;37(1):50–54. Heimann H, Bartz-Schmidt KU, Bornfeld N, Weiss C, Hilgers RD, Foerster MH; Scleral Buckling versus Primary Vitrectomy in Rhegmatogenous Retinal Detachment Study Group. Scleral buckling versus primary vitrectomy in rhegmatogenous retinal detachment. A prospective randomized multicenter clinical study. Ophthalmology. 2007;114(12):2142–2154. Jackson TL, Donachie PH, Sallam A, Sparrow JM, Johnston RL. United Kingdom national ophthalmology database study of vitreoretinal surgery: report 3, retinal detachment. Ophthalmology. 2014;121(3):643–648. Stanescu-Segall D, Balta F, Jackson TL. Submacular hemorrhage in neovascular age-related macular degeneration: a synthesis of the literature. Surv Ophthalmol. 2016;61(1):18–32. Salvi SM, Akhtar S, Currie Z. Ageing changes in the eye. Postgrad Med J. 2006;82(971):581–587. Rau CS, Lin TS, Wu SC, et al. Geriatric hospitalizations in fall-related injuries. Scand J Trauma Resusc Emerg Med. 2014;22(1):63. Andreoli MT, Andreoli CM. Geriatric traumatic open globe injuries. Ophthalmology. 2011;118(1):156–159. Haupert CL, Mccuen BW 2nd, Jaffe GJ, et al. Pars plana vitrectomy, subretinal injection of tissue plasminogen activator, and fluid-gas exchange for displacement of thick submacular hemorrhage in age-related macular degeneration. Am J Ophthalmol. 2001;131(2):208–215.